PA Chairman, ever the opportunist, uses reports of Papal visit to encourage PA tourism, rally for more international support. Palestinian Authority Chairman Mahmoud Abbas urged Christian pilgrims from around the world to visit the Holy Land to mark the visit of Pope Francis, set for 2014, AFP reports. The pontiff is to make a brief visit to Israel and the Palestinian territories from May 25, his first to the Holy Land, Israeli newspaper Yediot Aharonot said last week. Abbas used the opportunity of his annual Christmas message to appeal to Christians in support for the PA. "As we begin preparations for the visit of His Holiness Pope Francis next year, we call upon pilgrims from all over the world to come and experience Palestine and our Holy Sites," Abbas said. He claimed the pope's visit "will be a good opportunity for Christians from all over the world to become closer to their sisters and brothers in Palestine." Abbas added that he hoped the Francis would "spread the message of justice and peace for the Palestinians, as for all peoples of the world." During the visit, the pope will celebrate a high mass in Bethlehem, the traditional birthplace of Jesus, local media reported. The trip has yet to be officially confirmed by the Vatican, although the announcement could come in the weeks after Christmas. But a Vatican spokesman has said officials from the church have made a site visit. Pope Francis was invited to visit the Holy Land by President Shimon Peres in April, and by Abbas, who met him on October 17. 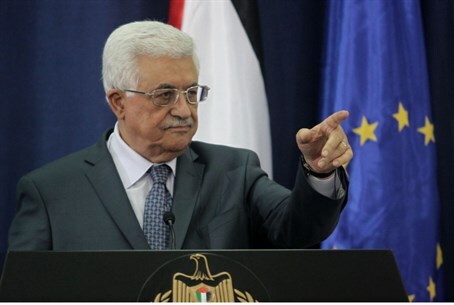 Abbas's statements continue a barrage of PA appeals to the Christian community for support, despite evidence that the PA is no friendlier to Christian Arabs than other parts of the Middle East. Earlier Monday, a PLO video surfaced claiming Jesus was "Palestinian" and depicting a Pope-like figure spreading Christmas "magic" among scenes of alleged Israeli "oppression." In a Christmas message on Wednesday, the Latin patriarch of Jerusalem, Fuad Twal, said the pontiff "cares about the Holy Land and the Middle East." Twal then denounced the "settlements" for "hampering" the peace talks between Israel and the PA.